4 venue changes, over a 100 queer artist spread out over the time, some bloody noses, some tears, a lot of laughs, almost 2 riots, some time in court, thousands upon thousands of Queer bodies through the doors and sweating on the dance floors, kissin, grinding, doing the naughty business and what do you have? 10yrs of FIERCE FAGGOTRY, FCKRY and a lot of BUGGERY! See your nasty deviant bodies on the dance floor atBlowpony 10yr anniversary! Saturday March 25th 2017! Saddle up and hold on tight, we’re gonna ride hard and long! 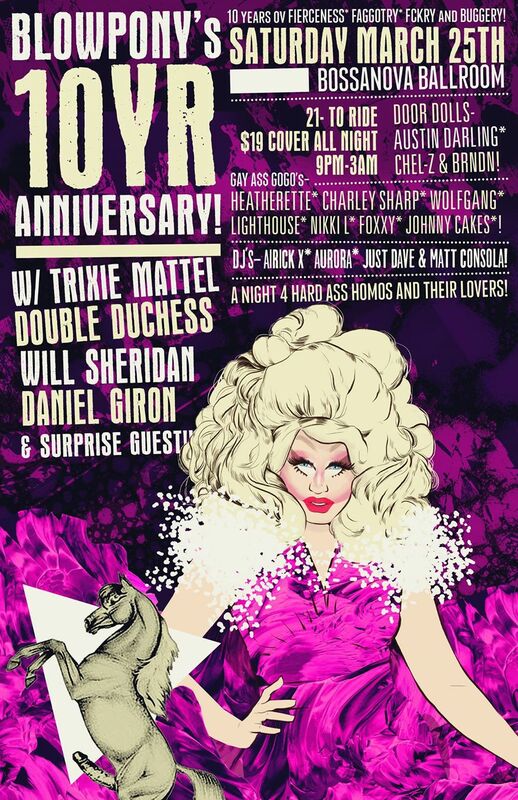 w/ Trixie Mattel* Double Duchess*Will Sheridan* Daniel Girón and some serious special guest! — with Ian O’Phelan at Bossanova Ballroom.